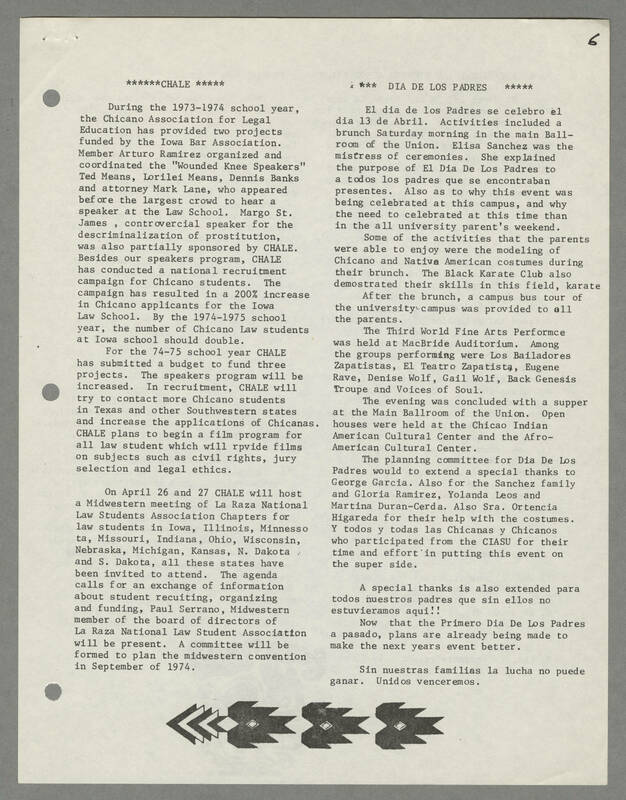 6 ******CHALE ***** During the 1973-1974 school year, the Chicano Association for Legal Education has provided two projects funded by the Iowa Bar Association. Member Arturo Ramirez organized and coordinated the "Wounded Knee Speakers" Ted means, Lorilei Means, Dennis Banks and attorney Mark Lane, who appeared before the largest crowd to hear a speaker at the Law School. Margo St. James , controvercial speaker for the descriminalization of prostitution, was also partially sponsored by CHALE. Besides our speakers program, CHALE has conducted a national recruitment campaign for Chicano students. The campaign has resulted in a 200% increase in Chicano applicants for the Iowa Law School. By the 1974-1975 school year, the number of Chicano Law students at Iowa school should double. For the 74-75 school year CHALE has submitted a budget to fund three projects. The speakers program will be increased. In recruitment, CHALE will try to contact more students in Texas and other Southwestern states and increase the applications of Chicanas. CHALE plans to begin a film program for all law student which will rpvide films on subjects such as civil rights, jury selection and legal ethics. On April 26 and 27 CHALE will host a Midwestern meeting of La Raza National Law Students Association Chapters for law students in Iowa, Illinois, Minnessota, Missouri, Indiana, Ohio, Wisconsin, Nebraska, Michigan, Kansas, N. Dakota and S. Dakota, all these states have been invited to attend. The agenda calls for an exchange of information about student recuiting, organizing and funding, Paul Serrano, Midwestern member of the board of directors of La Raza National Law Student Association will be present. A committee will be formed to plan the midwestern convention in September of 1974. *** DIA DE LOS PADRES ***** El dia de los Padres se celebro el dia 13 de Abril. Activities included a brunch Saturday morning in the main Ballroom of the Union. Elisa Sanchez was the mistress of ceremonies. She explained the purpose of El Dia De Los Padres to a todos los padres que se encontraban presentes. Also as to why this event was being celebrated at this campus, and why the need to celebrated at this time than in the all university parent's weekend. Some of the activities that the parents were able to enjoy were the modeling of Chicano and Native American costumes during their brunch. The Black Karate Club also demonstrated their skills in this field, karate After the brunch, a campus bus tour of all the university campus was provided to all the parents. The Third World Fine Arts Performce was held at MacBride Auditorium. Among the groups performing were Los Bailadores Zapatistas, El Teatro Zapatista, Eugene Rave, Denise Wolf, Gail Wolf, Back Genesis Troupe and Voices of the Soul. The evening was concluded with a supper at the Main Ballroom of the Union. Open houses were held at the Chicao Indian American Cultural Center and the Afro-American Cultural Center. The planning committee for Dia De Los Padres would to extend a special thanks to George Garcia. Also for the Sanchez family and Gloria Ramirez, Yolanda Leos and Martina Duran-Cerda. Also Sra. Ortencia Higareda for their help with the costumes. Y todos y todas las Chicanas y Chicanos who participated from the CIASU for their time and effort in putting this event on the super side. A special thanks is also extended para todos nuestros padres que sin ellos no estuvieramos aqui!! Now that the Primero Dia De Los Padres a pasado, plans are already being made to make the next years event even better. Sin uestras familias la lucha no puede ganar. Unidos venceremos.